Two guys, their assistants, and lots of magic. I want to hug whoever came up with the amazing idea to put these two crazy kids together. I’m talking about Professor Layton, the top-hatted Londoner who loves solving puzzles, and ace attorney Phoenix Wright. They’re like peanut butter and jelly—a delicious man sandwich that packs so much flavor you won’t want to go back to having one without the other. In a totally platonic way, of course. Professor Layton vs. Phoenix Wright: Ace Attorney, out today in North America for Nintendo 3DS, is their first adventure together and an epic team-up if you’re a fan of either series. (Seriously, maybe you’ve had dreams about exactly this.) But if you’re new to both, this is the perfect invitation to jump onboard. You’ll get to solve puzzles as Layton and his apprentice, Luke, or even as Phoenix Wright and his assistant, Maya. 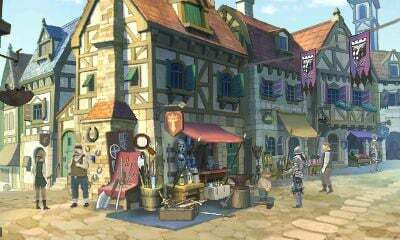 And when you’re not exploring the mysterious town of ye ol’ Labyrinthia, which is overrun with witches, you can crack cases in medieval court, shouting “Objection!” to your heart’s content. The fact that you’re always trading off between the puzzle-adventure parts and the courtroom cases are what makes playing the game so addictive. If you tire of one, you’ll soon have the chance to switch to the other. All four characters join forces, split up, and even change partners for a nice change of pace. Together, they help Espella, a young girl who fled to London seeking refuge only to entangle our heroes in her predicament. Labyrinthia is a medieval fantasy town far outside the modern day world, where people lead simple lives in fear of magic and in awe of the Storyteller. At every parade through town, he spreads the pages of their new life story—and everything he writes comes true. Like other girls in Labyrinthia, Espella is suspected of witchcraft, and it’s your job to defend her from these accusations in a court where the laws of magic are more understood than reason or logic and where witches are burned for the sole crime of being witches. Instead of slamming down incriminating photographs or voiceprint analyses, you’ll have to make do with hand-drawn courtroom sketches and testimonies from easily impressionable witnesses. Though the game stretched on for 30 hours, I never once lost interest in the larger mystery or the scenes at hand. Poor Phoenix cross-examines ridiculous characters like the village drunk and a squat, weird woman who calls her goat pet names like “milk muffin,” and just having to work around their idiosyncrasies and neurotic personalities is entertaining enough. The new “question” mechanic enables you to press characters and uncover new information when they appear surprised or bothered by someone else’s testimony, so the witness stand can become crazy fun when four or almost a dozen witnesses are crowded up there shoulder to shoulder. The Layton-inspired parts are more reflective and will have you exploring the beautiful, scenic backdrops of towers, forests, and alchemist workshops. The puzzles exude a fairy tale charm, sometimes featuring a painted illustration or adorable little versions of the main characters. Whether they’re in 2D or 3D, they’re a delight to behold. You might have to slide blocks into place to form a pattern or put things in the correct order based on clues. One of my favorites shows Luke running from a giant monster, so the visuals really make the puzzles pop and feel special and new. Between the wealth of hint coins you can find hidden in the environment and the generous retries and restarts in the puzzles and court cases, you’ll have plenty of chances to work out especially tricky problems. You can also save virtually anytime. The court cases can be exhausting at times. They tend to run long, and it can be tough determining the right piece of evidence to present against a witness. You can only make so many guesses before you lose all credibility (and the case itself). 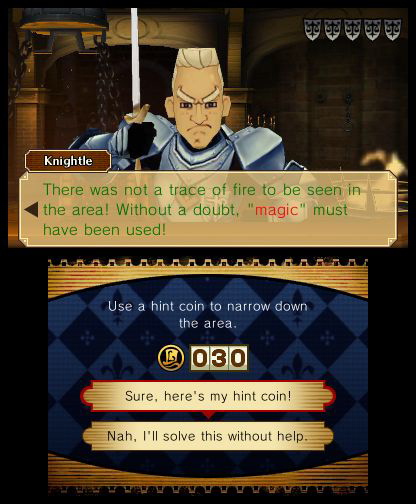 Most of my struggles came from trying to spot and prove contradictions in court rather than solving the kind of logic puzzles Layton relishes, but both provided their challenges. Otherwise, I was never once disappointed. The mystery kept me guessing, the puzzles and cases never got boring or predictable, and the flow of the game never ebbed from beginning to end. I haven’t played much of either the Layton or Phoenix Wright series, but now I want to go back through all their games and fuse them together with some magic of my own. I can see why people love these characters. 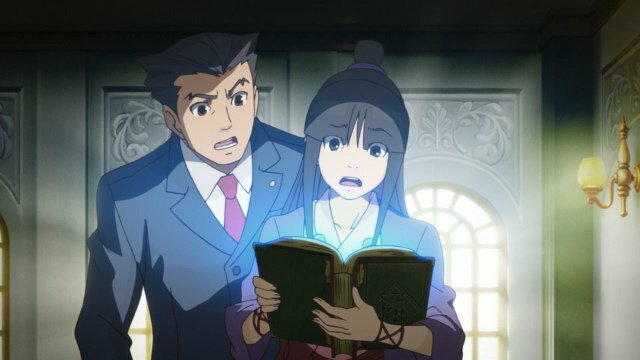 What sticks with me, too, isn’t just the fun musical chimes and dramatic noises accompanying the dialogue or the silly expressions of the two duos (Phoenix Wright’s look of exasperation is hilarious no matter how many times I see it) but also how curious the setup is. As Labyrinthia exists as a world outside the one Layton and Phoenix come from, it becomes an interesting parallel between history’s own witch trials and ones where magic and witches are real. At the same time it’s showing how ignorant and illogical the Salem trials must have been, it also presents the convicted witches as sympathetic characters. That kind of hindsight and perspective bring a little more color and depth to the story. Granted, I could do without hearing Layton’s polite “A gentleman always helps a lady in need” as many times as I did. For all its focus on women with terrible power, I wish Espella and even Maya at times weren’t treated so delicately. They’re clearly competent and don’t need as much protection as they sometimes receive. When you clear the game, you have the option of exploring the town freely and solving any remaining puzzles or replaying the final trial. If you connect to the Internet you can access some special bonus episodes and galleries, but these weren’t yet available at the time of my playthrough. Overall, I enjoyed the untwisting of Labyrinthia’s mysteries and will be obnoxiously yelling and pointing my finger at developers Level-5 and Capcom to make “Sir Dark Hat” and “Sir Blue Knight” team up again soon. For an adventure or puzzle game fan, it doesn’t get much better than this. Professor Layton vs. Phoenix Wright: Ace Attorney is available for Nintendo 3DS.